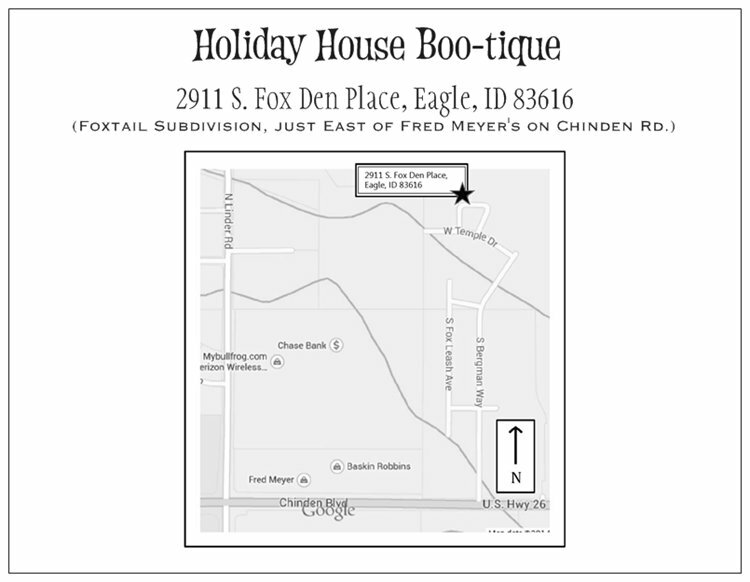 Holiday House Boutique: Holiday House Boo-tique 2015 is just one week away! Holiday House Boo-tique 2015 is just one week away! We're so excited to show off all the amazing handmade items our talented vendors have been working on! Please join us next Thursday, Sept. 24-26, from 9am-6pm at 2911 S. Fox Den Place, Eagle, ID 83646. The house is located in the Foxtail subdivision off Chinden Rd, just East of the New Fred Meyer Complex on Chinden/Linder. The house is so new it is not yet showing up on Google maps, so we have provided a map for you here. We hope you can join us!